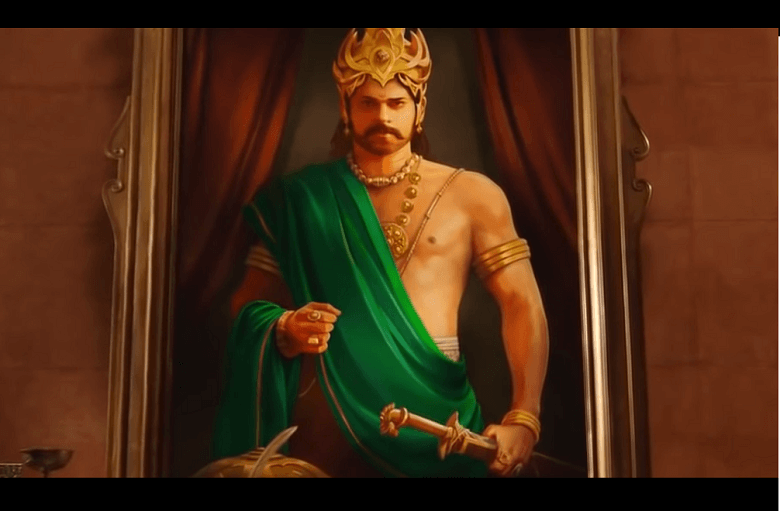 Third role of Prabhas in Baahubali 2 as Maharaja Vikramadeva revealed! Home Actors Third role of Prabhas in Baahubali 2 as Maharaja Vikramadeva revealed! The third role of Prabhas as Maharaja Vikramadeva was revealed in Baahubali – The Beginning itself! With less than ten days to go for Baahubali 2 – The Conclusion’s worldwide release, fans can’t wait to get answers to all the questions the first movie left them with. While you are bound to get an answer to the aching dilemma of ‘Kattapa ne Baahubali ko kyun mara?’, the first movie left us with a lot of other mysteries. One of them being, ‘does Prabhas play a triple role in the movie?’ Well, you don’t need to worry about finding an answer to that one as it has been confirmed that the superstar does in fact have three roles in the film! Prabhas’s third character of Maharaja Vikramadeva is in fact the father Amarendra Baahubali and in the beginning of Baahubali 2, you will see Kattappa narrating the story of Vikramadeva to Baahubali Junior. As the story goes, Vikramadeva is Bajjaldeva’s younger brother and the latter is jealous of him as he is chosen the king of Mahishmati. Bajjaldeva is a sly person and manages to get rid of his brother shortly after his coronation, leaving behind his pregnant wife. Since Vikramadeva’s wife is convinced that her husband’s death was not natural but a conspiracy, Bajjaldeva’s wife, Sivagami takes over as the ruler of Mahismati. After Vikramadeva’s wife’s death at childbirth, she raises his son, Baahubali as her own along with Bhallaladeva. The rest is known. The other two roles of Prabhas as Amarendra Baahubali and Mahendra Baahubali are well known to everyone, but his third role as Amarendra Baahubali’s father is what gives the story of Baahubali 2 a parallel story line. Director SS Rajamouli recently released a portrait of Maharaja Vikramadeva which set fans into a frenzy!We may even get to see Vikramadeva in action in Baahubali 2 in a cameo role. It is commendable how makers of the movie managed to keep this character under wraps until now. Baahubali is set to release in Hindi, Tamil and Telugu on April 28. Made on a massive budget of Rs. 250 crores, some reports suggest that the film has already raked in Rs. 500 crores before the releases through satellite distribution rights. This surpasses Baahubali 1 – The Beginning’s boxoffice collection of Rs. 600 crore and raises expectations of Baahubali 2 to become the first Indian film to cross a revenue collection of Rs. 1000 crores! Stay tuned for regular updates on Baahubali 2 – The Conclusion exclusively on Bollywood Garam.